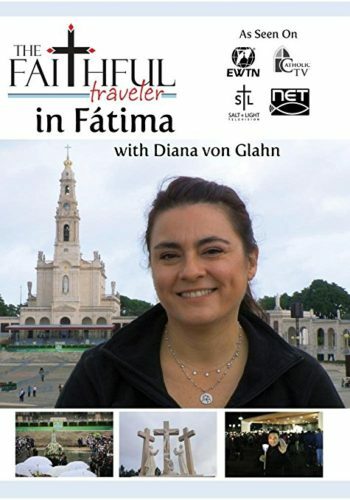 The Faithful Traveler, hosted by Diana von Glahn, explores Catholic shrines and places of pilgrimage around the world. • Aljustrel: where the three little shepherds were born and where they lived during the apparitions. • Parish Church: the church where Lúcia, Francisco, and Jacinta were baptized and where their families celebrated Mass. • Caminho dos Pastorinhos: The walkway through the grass and trees where the children walked on their way to the Cova. • Loca do Cabeço: Where the children met and prayed with the Angel of Portugal. • Cova da Iria: The field where the children met the Mother of God. • Valinhos: Where the children met the Virgin Mary after having missed their meeting with her in August. • Old Basilica: The beautiful old basilica where the three little shepherds are buried. • Statue of Mary: Learn about the American priest who carved the statue of Mary that adorns the Basilica, and the story behind its creation. • Capelinha: The little chapel built atop the site of the holm oak tree, atop which Mary hovered during her meetings with the children. • New Basilica of the Holy Trinity: The modern basilica built to keep pilgrims warn during the blustery months. • Papal Statues: Learn why there are statues of Pope St John Paul II and Pope Paul VI at the shrine. • Berlin Wall: See the remnant of the Berlin Wall brought to Fátima, to give thanks to Our Lady for her intercession in bringing peace to Eastern Europe. • Via Sacra: Walk the beautiful Stations of the Cross, donated by grateful Hungarians, and see the stunning chapel of St Stephen at the end, with the amazing statues of Calvary at the summit. • Sister Ângela de Fátima Coelho: Meet the effervescent and knowledgable Sr Angela, a religious, a medical doctor, and the Vice-Postulator of the causes of Blessed Francisco and Jacinta Marto at the Casa das Candeias—the House of Candles—headquarters of the cause and a museum dedicated to the lives and spirituality of Francisco and Jacinta Marto. • Candlelight Rosary: See the candlelight rosary procession. • Adeus! And wave your white hanky adeus (goodbye) with all the other pilgrims.